NICARAGUA IS moving from national crisis to potential national catastrophe. Six weeks ago, protests erupted in the capital, Managua, and other major towns, against the stifling 11-year regime of President Daniel Ortega. Mr. Ortega’s police and paramilitary gangs used force and violence, including live ammunition fired at civilians, to put down the demonstrations. Undaunted, Nicaraguans filled the streets again on May 30, in a mass march billed as a tribute to the mothers of the dozens of people killed during the previous crackdown. Once again, these protests were met with gunfire; 16 more people were killed, according to the independent Nicaraguan Human Rights Center. The total body count since April 18 in this Central American nation of 6.1 million has now reached 100, according to the center. It is clear Mr. Ortega has long since lost most of the popular support he may have once enjoyed, first as a leader of the 1979 Sandinista revolution and later when he made a political comeback and won the presidency in 2006. He has ruled through a series of corrupt bargains with the Catholic Church hierarchy and the leaders of the Nicaraguan private sector, which have turned a blind eye to his systematic co-optation of the judiciary, army, police and legislature in return for promises of stability and economic growth. Inevitably, this has ended in abuse of power and political instability. Barricades obstruct streets across the country, and a proposed national dialogue has broken down in the wake of the latest governmental violence. Yet Mr. Ortega, like his patrons and allies in Cuba and Venezuela, refuses to mend his ways, much less to consider stepping down, which is the current demand of what can only be called a popular democratic movement. Erstwhile regime allies in Nicaragua’s private sector, fearing civil war and the destruction of what had been a growing economy, have called on Mr. Ortega and Rosario Murillo, Mr. Ortega’s wife and vice president, to accept a dignified compromise, whereby there would be early elections, supervised by new and credible electoral authorities, rather than the Ortega loyalists who currently dominate the electoral machinery. Alas, the president and vice president have refused, and the examples of Cuba and Venezuela imply that the 72-year-old Mr. Ortega can survive in power long enough to rig the next scheduled election in 2021 so Ms. Murillo can become president as they have planned. Like those other two regimes, Mr. Ortega’s retains the loyalty of the military, police and intelligence apparatus, and the president has demonstrated that he is willing to shed blood rather than yield. There is a slight chance he might change his mind if Nicaragua’s democrats receive concerted hemispheric diplomatic support, similar to the stand the Lima Group (11 Latin nations plus Canada) has made against the Venezuelan government’s rampant abuses. It’s not much of a hope, but with U.S. influence at a minimum under the Trump administration, it offers one of the few possibilities that anyone outside of Nicaragua can help save the country. 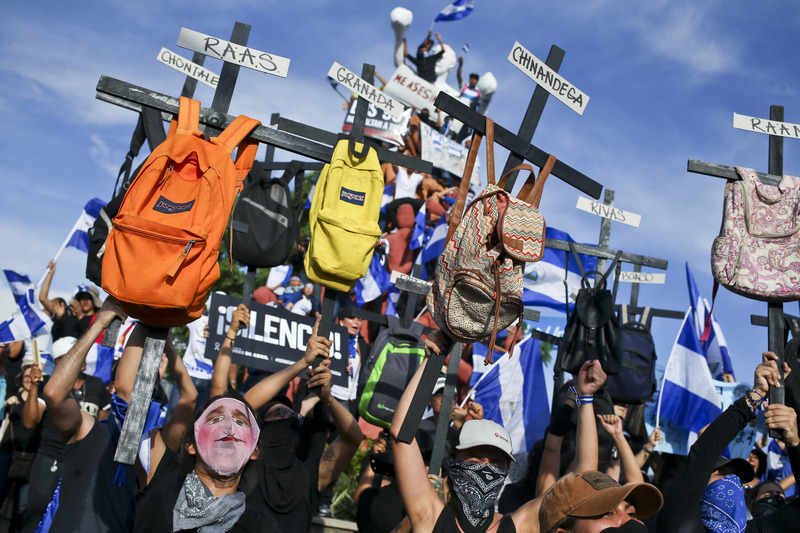 Student-led protests against President Daniel Ortega that began in April continue in the Nicaraguan capital Managua.